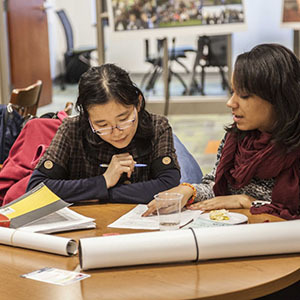 The Maytum Learning Commons draws together a variety of academic support services to create a “one-stop shop” for students in Allegheny’s Pelletier Library. Peer consultants assist students with writing, public speaking, and study in a variety of academic subjects. Our professional staff arranges accommodations for students with disabilities; consult with students on study skills such as time management, effective reading, and test taking; coordinate new student registration; and support the academic advising program. 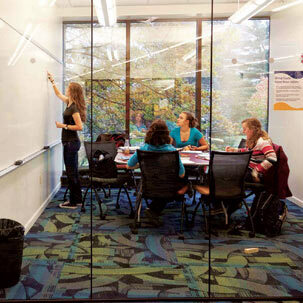 The Maytum Learning Commons and the offices that comprise The Allegheny Gateway are located on the main floor of the Academic Commons, which also includes the Pelletier Library. This newly remodeled space provides great opportunities for student tutoring, consultations, and group or personal study. Please stop by and visit us! When you enter the building, look for the orange carpet tiles and the sign for the Learning Commons. We hope to see you soon! Comments, questions, and suggestions for the Learning Commons are welcome and should be sent to learningcommons@allegheny.edu.